Michigan’s 2 million deer are most active in the spring and in the fall, so it’s not your imagination, you’re seeing more antlers than ever. Unfortunately, last year there were 60,000 deer-related auto accidents in Michigan. This is pretty typical for all years. That is a lot of damage and potential injury that these deer cause! Be at your best when driving: be sober, be alert and wear your seat belt. Be particularly careful on two-lane roads between dusk and dawn. 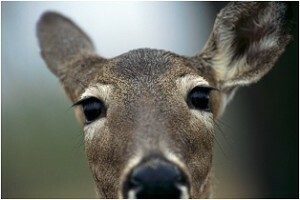 This is where the majority of deer-car collisions occur. That doesn’t mean that you can’t encounter a deer in the middle of the day or night or in the middle of a busy highway. We’ve seen one in the Costco parking lot! If you see a deer, slow down. Deer are herd animals and frequently travel in single file. If you see one deer cross the road, chances are there are more waiting. Look carefully before proceeding. If you know you’re going to hit the deer and won’t be able to stop in time, don’t swerve. Brake firmly, hold onto the steering wheel, and bring your vehicle to a controlled stop. If you do end up hitting the deer, don’t exit your car until you are sure it is safe. Lots of injuries occur after traffic accidents, especially in isolated areas, particularly at night.